I’m beginning to think that crepes are the unsung heroes of the lunchbox world. 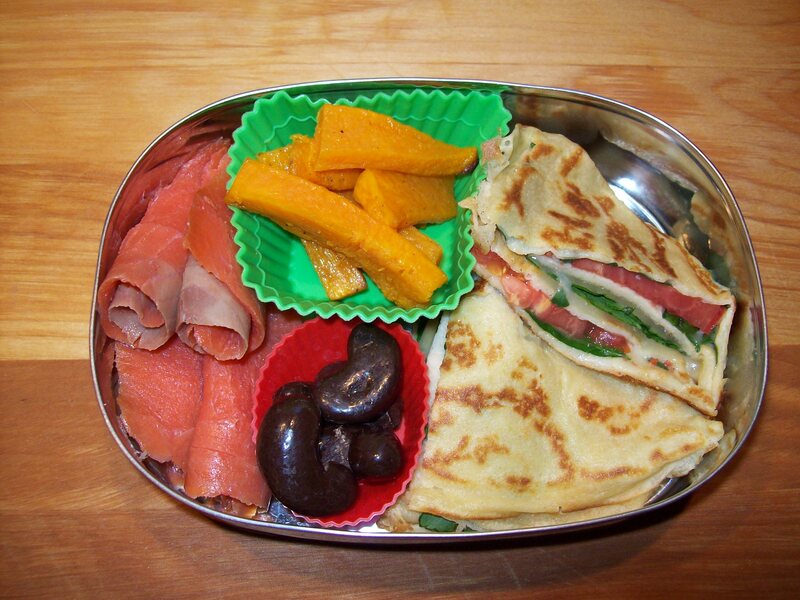 Sure, they’re not the first thing any of us thinks of when we think of packing school lunches; and sure, if you’re not an experienced crepe-maker, they can seem kind of fussy and daunting. But if you can manage them, they’re incredibly versatile, and apparently my kids, at least, don’t mind in the least eating them cold. I’ve packed crepes just filled and rolled quite a few times — that’s admittedly the easiest way to do it. But it seemed to me that if I crisped them up and folded them, filled, into neat little triangles, reminiscent of pizza or quesadillas, they might be far easier for the kids to handle. You could make your crepes in advance and refrigerate them with parchment between them, but honestly, I find that they’re so quick to put together that I have no problem taking a few minutes in the morning to just pour out one or two fresh ones right then and there. There is no limit to what you can stuff these with — the day after I made the crispy crepes shown here, I packed P. a rolled crepe that was stuffed with goat cheese, fresh berries, and honey, and thought later that I probably could have made his crispy-style, too. (Not that he minded — I actually got an after-school hug to thank me for that lunch.) These could be sweet, savory, vegetarian, meaty…it absolutely doesn’t matter. The big win for me was that when I made this simple vegetarian version, L. raved about them, and I got to feel really good about all the fresh produce he’d eaten without even, apparently, noticing. Warm an 8-inch nonstick skillet over medium-high heat. Brush with the melted butter, then pour in the crepe batter and swirl the pan around to coat evenly. Allow the crepe to cook until it’s set and looks dry around the edges. Carefully flip the crepe over. Lay 2 of the 1/2 slices of cheese on one half of the crepe, add half of the spinach leaves, top with 2 slices of the tomato, and sprinkle with salt and pepper. Fold the other side of the crepe over it, repeat the layering process with the remaining cheese and vegetables, and fold again into a triangle. Cook until golden and crisp on the bottom, flip, and allow to brown on the other side. Let the crepe cool somewhat before cutting it in half to pack in the lunchbox. NOTE: There are two crepe recipes I favor. One is this traditional wheat-flour crepe by Tyler Florence (I use white whole wheat flour with no problems); the other is my gluten-free adaptation of his recipe. Both batters are made in a blender in just seconds. Qst. I’ve never tried or actually been a fan of sushi. I always wondered how the fish bacteria is killed. Are they smoked at some type of temp? My teen doesn’t like fish, I wonder if she’ll take to sushi, like you’re rolled up salmon (I imagine it’s considered sushi as it isn’t cooked). Does it taste less fishy? I particularly love salmon (cooked). My teen will eat tuna though (in a salad form, not alone), which I think is pretty fishy compared to tilapia, halibut, etc. It’s actually not considered sushi, as it’s smoked — so yes, theoretically it’s “uncooked,” but the smoke cures the salmon and kills the bacteria.� I wouldn’t say it tastes less fishy, though.� Smoked salmon has a very distinct texture and flavor that some people love and others can’t stand; it’s one of my absolute favorite foods, and l.’s as well, but my mother, for instance, won’t touch it!� All I can say is…you don’t know until you try. Yay!� They looked really good.� I didn’t actually try one that day — guess I should have — but L. sure loved them!